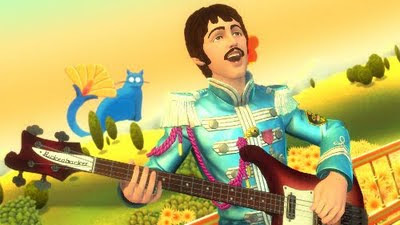 NextGen Player - Canada's Premier Entertainment Blog: So, Who's Picking up The Beatles: Rock Band? With Beatlemania approaching fever pitch, I decided to write an article over on the Future Shop Tech Blog which gives a solid overview of what to expect in The Beatles: Rock Band. "While the basic formula remains largely unchanged from previous versions, The Beatles: Rock Band does include a few new additions. A leaked retail listing originally hinted that The Beatles: Rock Band will be the first in the series to include three-part vocal harmonies -- a feature that has later been confirmed by Harmonix. Being the first Rock Band game based on a musical group, the Career Mode takes players on a journey throughout the band's career, from their humble beginning at The Cavern Club all the way to their historic rooftop concert at the Apple building."